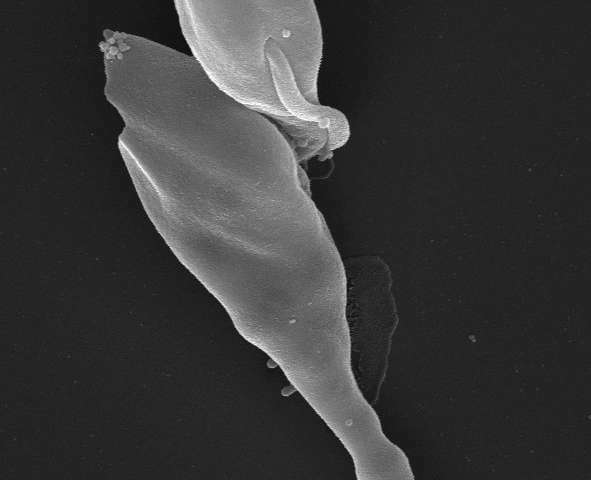 Scanning electron micrograph of mother (bottom) and daughter (top) trypanosomes. Credit: Lori Peacock and Wendy Gibson; specimen prepared by Gini Tilly, Wolfson Bioimaging Facility (University of Bristol). Researchers at the University of Bristol have revealed new details on how the animal disease Nagana is spread by tsetse flies in Africa. When animals are bitten by bloodsucking tsetse flies, they don't just get a painful bite, as the flies may be carrying a cargo of deadly microbes, trypanosomes. These microbes are squirted into the skin of the animal as the fly feeds and invade the bloodstream, causing the severe and sometimes fatal disease Nagana or African Animal Trypanosomiasis. Most livestock are susceptible to this disease including cattle, sheep, goats, pigs and horses. 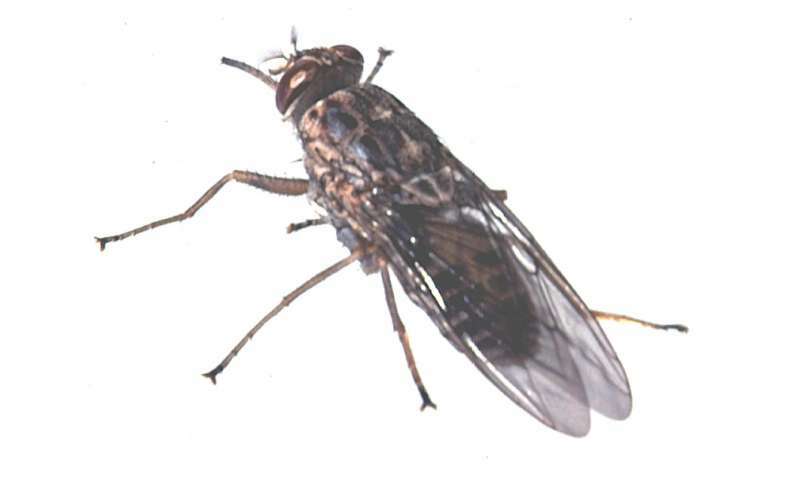 Tsetse flies pick up the microbes when they take blood from an infected animal. The blood is digested inside the gut of the fly, but the trypanosomes need to find their way back to the mouthparts so that they can be passed on to the next animal the fly bites. The University of Bristol's Trypanosome Research Group has now revealed details of how these tiny microbes achieve this incredible journey from the fly's gut to its mouthparts. Before they migrate, the trypanosomes accumulate in a particular part of the tsetse fly gut. This allowed researchers to study this population of microbes in detail over a time course of several days to find out exactly what they do. Professor Wendy Gibson from Bristol's School of Biological Sciences, led the research which has been published today in the journal PloS Pathogens. She said: "The key was getting large numbers of trypanosomes just at the start of their migration. We could then study these in detail by microscopy over the course of the next few days." The trypanosomes normally attach to the inside of the tsetse fly's feeding apparatus, but readily latched onto a glass microscope slide in the lab. The shape of each cell changed from long and thin to short and stout, before each then produced a new daughter cell, much smaller than itself. It is these daughter cells that go on to produce the infectious microbes found in the fly's saliva. Professor Gibson added: "This research contributes to our fundamental knowledge about the microbes that cause Nagana, a disease that severely affects livestock health and productivity across the tsetse-infested regions of sub-Saharan Africa. "In the long term, understanding how trypanosomes develop inside the fly may lead to new methods of controlling the spread of Nagana in Africa." More information: 'Shape-shifting trypanosomes: Flagellar shortening followed by asymmetric division in Trypanosoma congolense from the tsetse proventriculus' by L. Peacock, C. Kay, M. Bailey and W. Gibson, PloS Pathogens, 2018.